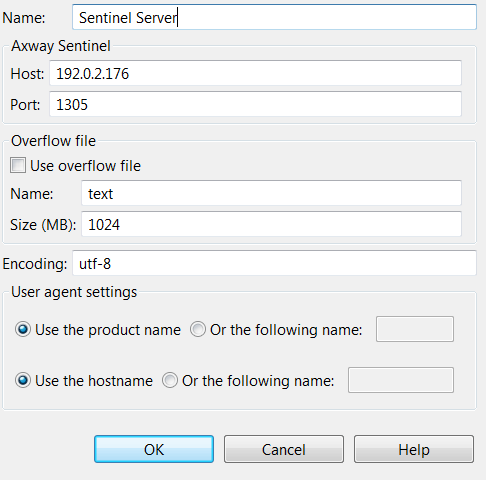 You can configure the Axway Sentinel server connection in Policy Studio under the Environment Configuration > External Connections > Sentinel Servers tree node. Tip Remember that the Sentinel server connection details should be named with alias names so that the configuration can be migrated easily through environments. Click and expand the External Connections node in the Policy Studio tree. Right-click Environment Configuration > Sentinel Servers, and select Add a Sentinel Server. Enter the FQDN or IP address of the Sentinel server in the Host field. Enter a valid TCP port on the Sentinel server to which events are sent in the Port field. In the Overflow file section, specify information about the file to be used to store API Gateway event data when there is no connection between API Gateway and Axway Sentinel. By default API Gateway registers events against the API Gateway's name in the topology. To use another name, select the option Or the following name and enter the name to use in the text field. By default API Gateway registers events against the host name of the machine running the API Gateway. To use another host name, check the option Or the following name and enter the host name to be used in the text field. For more information on configuring connections to the Sentinel server, see the API Gateway Policy Developer Guide.